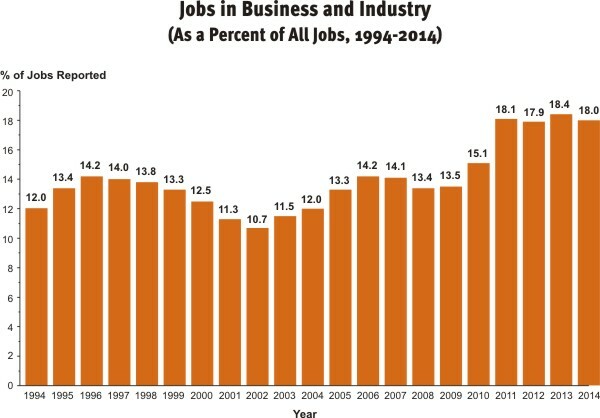 Since the mid-1990s, the percentage of employed law school graduates taking jobs in business and industry has increased from 12% to 18%, with half of that increase coming since 2011, when the percentage jumped up to 18.1% (from 15.1% in 2010), a level that has been largely sustained since. In terms of the number of jobs, it has doubled. 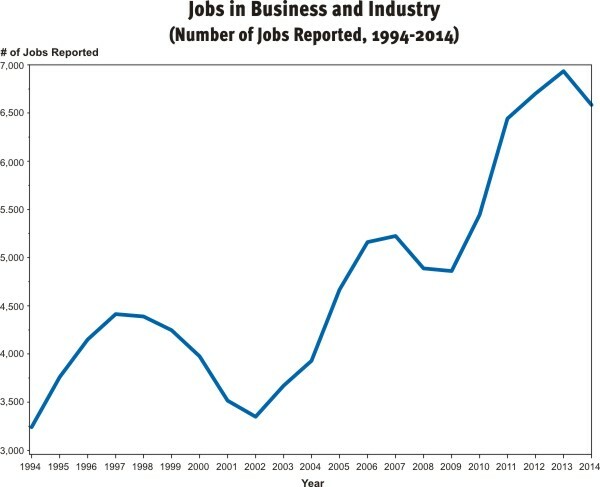 As the bar chart accompanying this article shows, the percentage of jobs in business and industry climbed steadily until 1997, then dropped somewhat in the next few years through 2002 before beginning a pattern of mostly sustained growth since that time, with a few exceptions. It should be noted that both the number of graduates and the percentage for whom employment status was known has increased in the past 20 years. However, the broad contours of the trend remain, and it is clear that the trend line is up as shown by the additional chart on the number of jobs reported in business and industry from 1994-2014. And, in fact, taking the figures back to 1992 shows that the number of jobs has almost tripled, and the percentage of jobs in business has doubled. For an earlier version of this column, see the November 2013 NALP Bulletin research column posted at www.nalp.org/1113research. Although other kinds of employers within business are tracked, such as those in publishing, management consulting, and entertainment/sports management, it remains the case that about half of the jobs in business and industry are with "other" kinds of employers not specifically tracked. This encompasses a wide range of businesses, such as all manner of retail, manufacturing, healthcare, and pharmaceutical businesses, to name but a few kinds of employers. NALP has tracked the kinds of jobs taken in business (regardless of business employer type) since 2001. Again a catchall category of "other" has dominated, but opportunities in management, consulting, and marketing have grown, providing over 1,400 jobs to the Class of 2014. The number of in-house legal jobs has doubled, from about 500 to over 1,000. Starting with the Class of 2014, compliance jobs were tracked; with over 600 such jobs reported, compliance was the next largest specific job type reported after in-house legal. Finally, the growth of business jobs that are categorized as JD Advantage (JD Preferred prior to 2011) is evident. The percentage of jobs for which bar passage is required has drifted up and down. Prior to 2001, jobs were classified as legal, other professional, and non-professional, so direct comparisons with 2001 and later years are not possible. During the 1994-2000 period about 40% of business jobs were reported as legal. It is likely that some portion of these jobs were closer to the JD Advantage categorization than to a job for which bar passage, in addition to a JD degree, was required. Since 2001, the share of business jobs reported as JD Advantage has doubled, and in 2014 they accounted for almost half of business jobs. * This figure includes jobs with both law-related/legal technology companies (138 jobs), and other technology/e-commerce companies (456 jobs). Prior to 2014, all such jobs were included in an overall technology/e-commerce category.